Before the housing collapse, when applying for a loan, you would go to your bank or mortgage broker and apply. Upon approval, they would explain the property would be appraised by a real estate appraiser and as the borrower, the cost of the appraisal was to the borrower (even though the appraisal is for the lender). The appraiser would either bill the lender the cost of the appraisal or coordinate payment when the appraiser was at the house. Sometimes, the lender would pay for it and roll it into your mortgage and all was said and done. The appraiser would most likely be on the lenders list of approved appraisers and had a professional working relationship with the lender and as a borrower, you knew exactly how much was paid for the appraisal and to whom it was paid. Post crisis, appraisers were blamed for almost everything, the crash, high and low values, the weather, super bowl losses and pretty much everything wrong under the sun. There were some bad apples, but they did not make up the majority? Enter the Appraisal Management Companies (AMCs) to save the day. They grew panels of appraisers from all over. All you needed was a license, insurance, a computer and a phone (so they can call you multiple times a day for updates). They were to act as a firewall between lenders and appraisers to “ward off collusion” and make things better. The AMC was to MANAGE orders and place them with the appraisers, make sure that appraiser independence is fully enforced, and to act as third-party affiliates of banks. This was governments way to “fix” things, although the real broken aspect of the process were the banks and lenders themselves and we all know how nothing happened to them. So where am I going with this? I’m headed to the part where you, the consumer is being cheated and overpaying. Remember how consumers once knew the cost of the appraisal up front and who the payment was made to? Do you know this information with confidence today? Do you know for sure that all that money you paid for the appraisal is going to the appraiser for their services? If you said yes, the answer is, actually no. No one is being honest with consumers about this aspect of the mortgage loan process. In fact, lenders and their AMCs make it a requirement that appraisers can’t discuss the fee with you, much less include an invoice with your appraisal. In short, the fee you pay for an appraisal, with your money, is not going where you thought it was and I’m writing this to help consumers dig deeper into the representations being made to them. Say you pay the bank $550 for an appraisal up front. You paid the fee to the lender or AMC thinking this is how much the appraisal costs. I would think that as well but this is an example of what is actually happening. Here are a couple examples. These examples come from various appraisers around the country. In this example the Appraisal management company charged the borrower $1,150.00for the appraisal. The Appraiser who is doing the work is only paid $500.00, while a mysterious profit of $650 is kept by the AMC for managing the order. The Appraiser who carries the ultimate liability is making less than the managing middle man AMC, and they have gotten rich doing this. As a borrower, you just paid an extra $650 out of your pocket for an appraisal that cost $500. Sound fair and honest? This makes me sick! Actually it makes me sad. In this example which is not as extreme as the first one, the AMC charged the borrower $500 for the appraisal. The Appraiser was paid $259.00 for once again doing all the work and carrying all the liability, while the AMC made $241. With this example, I can almost for certain say that this fee paid to the appraiser is well below a fair and customary market rate for an appraisal, but AMCs wanting to maximize their profit find appraisers to work for much less. It represents perfectly how AMCS search for appraisers (who could be from very far away and not understand your market) to take work for less so that they can pocket more. With this example I need to clear some things up. First, this is an appraisal order for a typical appraisal plus additional forms. In my area, the reasonable fee would be at least $500 for a similar product. As you can see the AMC has charged a total of $545.00 and decided that a product that requires more work on the appraiser’s part is worth less and that they will take $245.00 out of the fee for themselves. I have many more examples to share but hope these shed light on what I believe to be a new issue taking from consumers by lender third party affiliates. AMCS are up charging consumers while searching and finding the cheapest and fastest appraisers to do the job, so they can profit more. I probably know what you are thinking now. Nothing wrong with finding the cheapest. We all do this all the time to save money. Here is the difference; this was a culture created. AMCs must make money and make their shareholders more money. By pitting appraisers against each other they created a culture where work goes to the cheapest and fastest while ignoring quality, competency, knowledge and experience. Ask yourself this…are you looking for the most experienced realtor when selling your home or just the cheapest and fastest? Are you looking for the cheapest and fastest lawyer when you need one? Probably not. But at least you know what you are getting either way and you know exactly where the money is going. Are you laughing with me now? No…..Ok. Yes, consumers are paying what they think is a market fee for an appraisal but making the middle man rich. Why do you need to pay money to someone acting on behalf of the lender? I ask myself this question every day, which is what inspired me to write this blog. Why isn’t the lender paying this company for their services? Why are consumers paying extra money for a bank affiliate? Especially when the actual appraisal costs less than what consumers are being charged. I know this to be fact because laws in my state require me to disclose what I was compensated in the appraisal report. At least in my state when I report I was paid $450, and you were charged $550, you would know where that extra $100 went. Well, maybe not but I hope that consumers begin to ask. This my friends is called TRANSPARENCY. Shouldn’t consumers know where their money is going to? Shouldn’t you be allowed to know? Shouldn’t you have some sort of trust in your lender to know that you are going to get an experienced appraiser to appraise probably your biggest asset? If you were able to hire your own appraiser, would you look at their experience, reviews, knowledge, pricing, and at the end do an interview with them? I know I would. Appraisers today sign so many certifications and documents, bound to USPAP (google it, it’s easier that way), state and federal regulations, as well as professional affiliations and continue to protect the public trust. But here’s the question…how is the AMC protecting the public trust? So, what’s not in your wallet? It’s the extra money you should have left over if you were paying for the appraisal and not paying for a banks third party affiliate. Do your homework. Ask your lender these hard questions and see what they say. Time to dive into the blogosphere world with my first post. They say you are supposed to write these from the heart and be passionate about what you are writing. Most people who know me would affirm how passionate I am about the real estate appraisal industry and profession. Sometimes, so passionate that I get caught up doing all the talking while sprinkling some F-Bombs, a couple shits and damns within a 15-word sentence. I guess then, I’m on the right track and here goes. 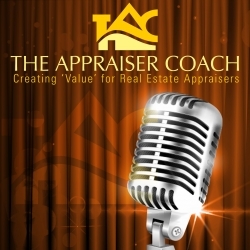 There are really great valuation bloggers out there already who give you the ins and outs of the appraisal process, how we do things, what we look for and how we determine value. Some bloggers provide detailed charts and graphs as well as great content for the industry. I have the most respect for them helping other people and their blogs are great. While I’ll certainly share my experiences and some similar content, this type material is not my main objective. My goal is to use my voice, other avenues of information resources, and my passion to hopefully shed some light on this wonderful business enterprise. The real estate appraisal profession is so much more than a person coming to your house for 20-45 min and taking pictures. It’s more than a person pulling comparable sales, market data and then coming up with an opinion of value. There is a deeper world that exists. For example, the regulations (or currently I should say, the loosening of regulations), a former Attorney General of NY who made some bad deals and decided to create more issues, AMCs (Appraisal Management Companies) that overcharge consumers and underpay appraisers, and of course poor lender behavior. These are some of the things I hope to share with you in my own words, and hopefully become a better writer along the way.